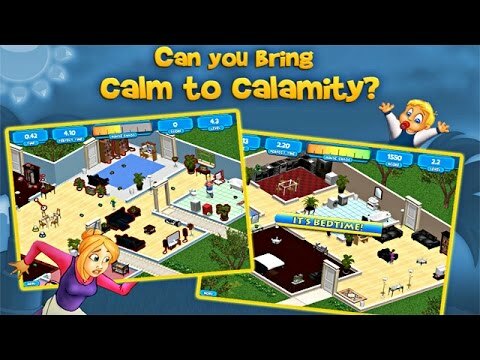 Clean up the mansion save a celebrity family from the brink of destruction. "I have only recently discovered the Nanny Mania games, and I was surprised to find that I really love them! In the game, the Nanny is hired to work for a famous family with rapidly increasing celebrity. I have played both Nanny Mania 1 and 2. If i had to choose just one, I'd say I prefer this one. I recommend this game!" Emma is back in action, this time as the nanny for a prominent Hollywood couple. But this household is anything but tidy. It's a mad-dash to clean up the mansion before the parents come home. You'll have a baby to watch, kids to clean up after, clothes to launder, and a whole living room, bedroom, kitchen and playroom to organize. Purchase deluxe cleaning supplies and prove to that household what a real nanny can do.